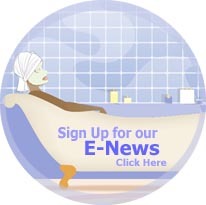 Every month we choose a different "all natural beauty" product or book to put in our Spotlight. We feel that these are the best of the best. We think that you will agree! Think you know a lot about sunscreen? Well think again! 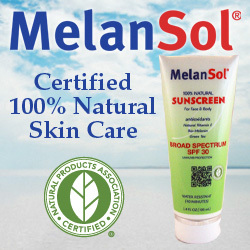 Michael Russ of Oceana Naturals, U.S. distributor of MelanSol? 100% Natural Skin Care Products, along with Peter Zahner (inventor of the products) have written the most interesting and information-packed e-book on this subject that I've ever seen. I love it because it's not just your typical information packed with lies and wishful thinking about the subject. It's filled with reasons why the old school products simply don't work the way they should, and on top of that they are probably dangerous to your health! What are the three ways that can help you rule the sun and your health (it's probably not what you think). What are the negative side effects when using sunscreens that need to be reapplied over and over throughout the day? Is there such a thing as a 'Waterproof Sunscreen'? What does the 'SPF' really mean and how do I know which one is right for me? Why should I avoid 'chemical' sunscreens at all costs? How can I protect my children from the harmful effects of the sun in a safe way? Where do dermatologists say 85% of the non-melanoma skin cancer occurs on the body? Why it is so important to incorporate antioxidants into my sun exposure? What is astaxanthin and Astaxanthol, and how do they figure into the sun protection equation? What is Bio-Melanin and why is it in MelanSol? sun care products? What is the formula for determining my personal SPF? How can I increase my natural skin protection during unprotected sun exposure? How does sunscreen directly impact my immune system? How do I correctly apply sunscreen? Who invented MelanSol? Products and why? What I really like about this book is that it doesn't vilify the idea of going in the sun. Quite the contrary, it encourages it! You'll learn how important it is to your good health, if done correctly. As Michael says "A tan is not a sign of skin damage. It is your skin’s response (melanin production) to help protect itself from harsh UV light. Skin stress—pink to red and tender skin—is your skin’s way of telling you it is losing the battle to protect itself and that additional actions need to be taken to ensure its skin cells don’t incur further free radical damage." He also shares with us how he prepares for sun exposure before a sunny vacation. There are ways to sun safely, and there are ways to sun foolishly. After reading this book, you will have a greater understanding of why the traditional sun products should be deemed obsolete, and why MelanSol?, a completely natural line of products, is the safer way to go. Also included in the book are some great links as well as book recommendations. I highly recommend getting this e-book! Don't wait until bathing suit season. The sun is out all year, and besides, you should know why you should be getting the benefits of the sun even in the cooler months. The information in this book will surpass your expectations! I'll leave you with this quote from Michael. "When sun exposure is approached with intention, awareness, and common sense and then combined with natural internal and topical bioactive antioxidants, like those used in MelanSol? 100% Natural Skin Care, the sun becomes your greatest resource for building and maintaining a top-notch immune system." Download Your Own Copy Now for Just Ninety Nine Cents! Michael J. Russ is an author, speaker, sun care expert, and founder of puresunscreen.com. He is a passionate advocate for using certified natural skin care and pursuing a healthy and energetic life. His credits include numerous radio interviews, blogs, and articles about natural sun care and how anyone can use basic life tools to transform their life to experience more happiness and fulfillment. Michael currently owns and operates two companies. As an author, Michael has also written, produced, and published five other audio and eBooks, along with many articles that convey ideas, concepts, and techniques you can immediately employ to actively create the passion, love, optimism, happiness and success you deserve in your life. Download 'Sun Care Decoded' by Michael Russ with Peter Zahner! Copyright 2003-2013 ? SharAmbrosia. All rights reserved. Copyright ? SharAmbrosia 2003-2013. All rights reserved.